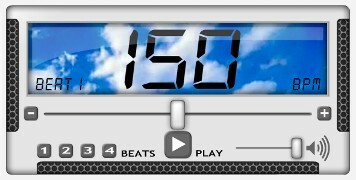 I like to set the metronome to about 150 bpm and start by playing one note per beat. You may be more comfortable at a slower or faster bpm setting. After I run up and down a scale or arpeggio a couple times while playing only one note per beat I start to play two notes per beat. If I start to miss notes or play them sloppy I go back to playing one note per beat. And when I'm ready for a challenge I turn up the metronome bpm or I try to play triplets (three notes per beat). Some scales are perfect for playing triplets such as the scale I show in The Major Scale video. That way of playing the major scale has 3 notes per string so it has a triplets 'feel' to it. You may find other methods that work better for you. Try to make up your own routine. Whatever methods you enjoy using you will likely do more of, so keep it fun. You may also find a metronome helpful while practicing difficult riffs. When I was figuring out the Advanced Super Mario Bros guitar tab I ran into a lot of things I just could not play. That was the first song I ever used finger picking to play, so it was brand new territory for me. Before that song I would use a pick almost exclusively. I used the metronome to keep me practicing at a steady rhythm, this may work for you as well. What I would do is play the same 5 or 6 notes over and over again until it was more comfortable for me to play. It helps to chop the difficult section up into a nice little loop that you can play over and over repeatedly without too much time between the part that gives you trouble. A lot of beginners wonder how they can improve when it comes to playing chords. One way to improve your ability to switch between chords is to play along to a metronome. Set a nice slow bpm for yourself and try to play the chords neatly with each note sounding clear. One way to accomplish this is to play a chord and then pluck each note of the chord individually and to the beat of the metronome. By playing each note seperately, after playing the whole chord, you can be sure every string is ringing out. Click the image to go to the Online Metronome.